ICIMOD Pakistan celebrated International Women’s Day 2014 in collaboration with its partner organizations, including the Mountain Areas Farmer Support Organization (MAFSO), United States Agency for International Development (USAID), Department of Foreign Affairs, Trade and Development (DFATD), Plan Baltistan Culture and Development Foundation (BCDF), Red Crescent Society, Baltistan Electronic Media Reporters Association (BEMRA), Baltistan Arts and Social Empowerment (BASE), Civil Society Human and Institutional Development Programme (CHIP), and Aga Khan Rural Support Programme (AKRSP), on Saturday 8 March 2014 at the Federal Government College for Women at Skardu, Gilgit-Baltistan. 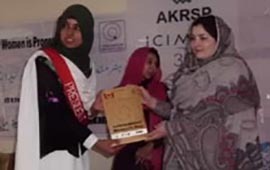 Mrs Amina Ansar, Member of the Gilgit-Baltistan Assembly, and Mrs Nighat w/o Deputy Commissioner, Gilgit-Baltistan, chaired the inaugural session. Around 400 women from different organizations, entrepreneurships, civil society, farmers, and students participated in the event. 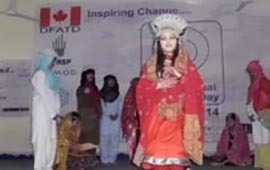 Celebration activities included a cultural show by local girls and debate competition among school students on the theme of the day, which was ‘Equality for Women is Progress for All’. 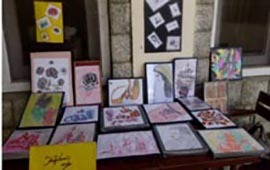 In parallel, community women arranged an arts and handicraft exhibition. During the exhibition, MAFSO gave a presentation on women’s empowerment for awareness among local communities. A message from Dr David Molden, Director General of ICIMOD, was circulated among the participants. The event concluded with the dissemination of certificates and shields to the performers and community women.